Hopefully if you've been coding .NET for a while, someone has shown you Reflector, Lutz Roeder's .NET Object Browser and you have basked in its glory. Surprisingly (to me at least) not everyone knows about Reflector's plugin model. There is a vibrant and active community of plugin writers out there, and you won't realize the full power of Reflector until you download some of these are start messing around. Seriously, if you thought that Reflector was useful today, just wait until you've tried some of these add-ins. The one I've been messing with for the last few weeks is the PowerShell Language Add-in. Reflector can "decompile" (not the correct word) the IL within an assembly and show you the "intent" of that IL in any number of languages like C#, VB, Delphi, etc. Daniel "kzu" Cazzulino has created a PowerShell Language Add-in that, for the most part, shows you what the code would look like in PowerShell. Now of course, it's important to note a few things. PowerShell is not (yet) a language that you can use to author .NET assemblies with. It is, however, an incredibly powerful scripting and automation environment. Sometimes the Powershell language (it is a language, by the way, with a formal grammar - here's a link (PDF)) can be a little confusing to learn, so the PowerShell Language Add-in is a really cool way to learn more about PowerShell within an environment you're already comfortable in. Here's a reformatted snapshot of what's currently available. FileDisassembler: This add-in can be used to dump the disassembler output to files for any Reflector supported language. SQL2005Browser: This add-in allows to browse .NET assemblies stored in SQL Server 2005 databases. FileGenerator: This add-in can be used to dump the disassembler output to files for any Reflector supported language. Deblector: This add-in allows to debug processes from within Reflector. Doubler: A code generator for unit tests, stubs and wrappers. Graph: This add-in draws assembly dependency graphs and IL graphs. Please read the install instructions here. DependencyStructureMatrix: Allows you to create and browser dependency structure matrices. SequenceViz: This add-in draws sequence diagrams. PowerShellLanguage: Renders output as Windows PowerShell script. DelphiLanguage: The Delphi view that is used inside .NET Reflector provided as a language add-in. CppCliLanguage: This add-in extends Reflector with a C++/CLI language rendering module. Hawkeye: A tool that allows you to debug the UI tree of Windows Forms applications. ClassView: Shows class definitions as plain text with color coding. 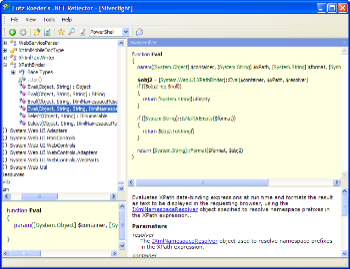 CodeModelViewer: This add-in shows the underlying code model objects for selected items. TestDriven.net: This Visual Studio add-in can navigate to any code element inside Reflector with a single click. AutoDiagrammer: This add-in draws class diagrams. Nice! I am always encouraging people to use a lot of these addi-ins. Thanks for letting me/us know about the POwerShell add-in. There are many Impressive plugins but many take an impressive amount of time to get working. Examples? There were a few that had some prereqs, but I didn't have much trouble. FYI, I also put out the Running Assembly add-in. It's not hosted on Codeplex though. You left out the BAML Viewer which allows you to decompile BAML to XAML and can then be saved to file. Through an unrelated set of circumstances I just discovered the shiny goodness that is Reflector. Anyone have "favorite" plugins? Mine so far are Graph and CodeMetrics. wow - I new about Reflector but had no idea about the plug-ins ... thanks Scott! Uhm, you may want to run a DIFF on your columns above... Too bad there's not a de-duplicator add-in.